The story goes (depending on whom you believe) that Doors cofounder and frontman, Jim Morrison, was getting hot 'n' heavy with a young gal before a concert in New Haven, Connecticut. A police officer came in and caught them, telling them to leave. Morrison replied, "Eat it," and the situation escalated to the point of the officer spraying Morrison (and maybe or maybe not the girl; accounts differ) with mace. The incident apparently spilled into the act, as Morrison continued to taunt officers from the stage, after an hour's delay in the performance while he recovered from the mace. Morrison whipped the fans into a frenzy (they were already hyped from the hour-long wait), and police eventually stormed the stage and carted a belligerent Mr. Morrison to the pokey. Relations between the band and the boys in blue never recovered. Unbelievably, this is by far not the most outrageous stage stunt put on by The Doors. Well, by Morrison, as the case may be. His onstage antics regularly included drunkenness and occasionally featured oddities like screaming insults at the audience, cursing pointlessly, and a few rather obscene gestures, even by rock and roll standards. In fact, charges resulting from said behavior that occurred in Miami, Florida were still pending at the time of Morrison's way too early, way too tragic death. The legend known as The Doors was born two years before the New Haven incident, in 1965, in Los Angeles. The founders were the maced Morrison on vocals, joined by Robby Krieger on guitar, Ray Manzarek on keyboards, and John Densmore on drums. Manzarek and Morrison were graduate students together at UCLA, studying film, and Morrison was already somewhat of a poet. Morrison reportedly named the band, borrowing a bit from the title of an Aldous Huxley book by the name of The Doors of Perception, which had, in turn, borrowed from a quote of the famous William Blake. Blake once stated, "If the doors of perception were cleansed, everything would appear to man as it is, infinite." That's kind how the far-out, flippy mind of Morrison and The Doors worked. The Doors was a unique brand of psychedelic rock, blues rock, and acid rock. Psychedelic rock is not so much a genre as a catch-all term for music that is created to enhance and improve the mind-altering experiences produced by drugs, particularly LSD. Similarly, acid rock is developed to go along with an acid (LDS) high, marked by distorted guitar sounds, lyrics laced with drug references (see what we did there), and lengthy jam sessions that are completely improvised. Acid rock later evolved into both Progressive Rock and Heavy Metal. The Doors borrowed heavily from blues rock, a fusion of musical styles, featuring elements of blues and rock and roll with lots of electric sounds from guitars and keyboards. Blues rock eventually evolved into today's Hard Rock, Southern Rock, and lent some elements to Heavy Metal, too. But it was Morrison's poetic lyrics, as much as the band's musical abilities and style, that catapulted The Doors to fame. 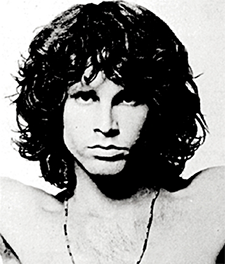 He created an alter ego called Lizard King, derived from a poem he wrote entitled, "The Celebration of the Lizard King," and a couple of The Doors songs contain lyrics directly from that poem. In their original incarnation, The Doors produced 8 albums, 7 of which climbed to the Top 10 on the Billboard 200 chart. In total, they have 20 Gold, 14 Platinum, 5 Multi-Platinum, and 1 Diamond albums just in the US market. A few of their notable achievements include a Rolling Stone ranking of #41 on the list of 100 Greatest Artists of All Time, as well as three spots on the 500 Greatest Albums of All Time. The band was inducted into the Rock and Roll Hall of Fame in 1993. By 1970, Morrison's drunken and erratic stage behavior reached a climax. While performing in New Orleans, Louisiana, Morrison underwent a complete meltdown, smashing his microphone multiple times into the floor, he then sat down and wouldn't complete the rest of the performance. Afterwards, the rest of the band met and concluded that Morrison was simply incapable of continuing to perform. Their official disbandment was in 1973. After the breakup, Morrison packed up his girlfriend, Pamela Courson, and headed to Paris. But the getaway would be short lived. She found him dead in their apartment bathtub on July 3, 1971. Although autopsies were not performed in France when no foul play was suspected, it's almost certain that his heart gave out due to massive drug and alcohol use. His headstone is translated to read, "True to his own spirit." Morrison was 27 years old, placing him in the notorious "27 Club" of amazingly talented musicians who passed away at the age of 27. The list includes Janis Joplin, Jimi Hendrix, Ron "Pigpen" McKernan, Jim Morrison, and more recently, Amy Winehouse and Kurt Cobain. The Doors reformed again in 1980, some 9 years after Morrison's passing. Unlike the unsuccessful regrouping of many tired, outdated bands, The Doors were well received and sales were even stronger than in the early years. Borrowing from the cult status of Morrison, record sales were better than before, leading to another album in 1983, and some biographical nods in film. The remnant of members still regularly releases film, music, and merchandise, keeping The Doors forever alive in the hearts, minds (and pocketbooks) of fans, both old and new.